Polished nickel finish steel and acrylic create a compelling design for this energy-efficient LED floor lamp. Bring energy-efficient lighting to a living area or bedroom with this stylish contemporary LED floor lamp. This adjustable design from Robert Abbey features steel construction in a polished nickel finish, with an acrylic post body. A glass diffuser is included, and this lamp is equipped with a four-way dimmer switch at its socket. Adjusts from 39 1/2" high to 53 1/2" high. Base is 3/4" high x 7 1/2" wide x 10" deep. Shade is 2 3/4" high x 3 1/4" wide x 8 1/2" deep. Built-in LED module has a light output comparable to a 100 watt incandescent. 1600 lumens. 3000K color temperature. 90 CRI. 4-way dimming touch switch. 12-foot long silver cord from socket. 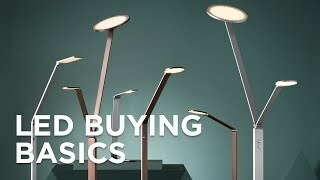 Plexus adjustable energy-efficient LED floor lamp by Robert Abbey. Polished Nickel finish over steel construction. Acrylic post body. Metal shade with glass diffuser. Distinguish your modern living space with the helpful presence of this Cooper adjustable energy-efficient LED floor lamp.